It’s no secret that we love Amazon SES – we released a plugin that specifically helps you set it up on your WordPress site. But it’s also worth looking at what else is around, and how they stack up against the tools we know and love. In this week’s article we’re going to take a look at some of the biggest competitors to Amazon SES, (Mailgun and SendGrid), and see how they compare. Each of these services are very good at what they do, but tend to do things a little differently, so it’s important to have a good idea of what you’re looking for in a transactional email provider. You’ll want to estimate how many emails you plan to send per month, since each provider will charge you based on the amount of emails you send. A provider might be cheaper for one person sending 5,000 emails per month, but significantly more expensive than another provider for someone sending 50,000 emails per month. You also want to pick a provider that will enable you to establish a good sending reputation so your emails don’t end up getting flagged as spam. Luckily, all three of the providers in this article will give you the tools and information you need to do exactly that. Something that may be a bit harder to evaluate without actually giving each provider a try is the ease of use. It’s not worth using a provider that gets in your way more than it helps you. 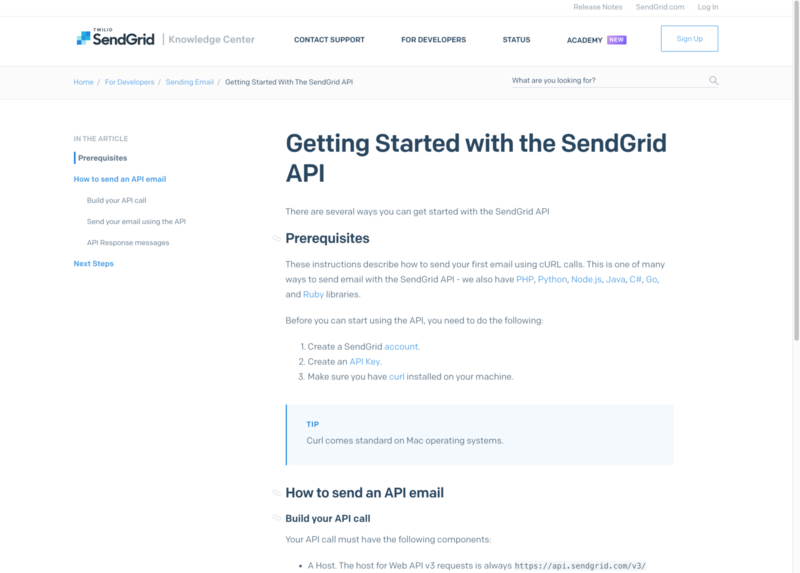 As you might expect, Mailgun, SendGrid, and SES all have a lot of functionality in common. With all three services you can set up a domain to send transactional email with best practices in validation and DMARC compliance. But each service has a few things that make it stand out from the others. One of the main benefits to Amazon SES is that it integrates with other services in the AWS platform. 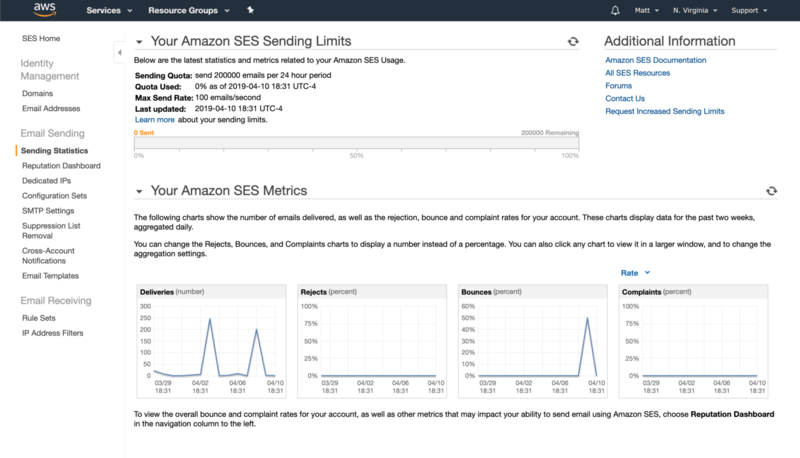 You can use it seamlessly on a site hosted by EC2, configure custom notifications with the Simple Notification Service (SNS), and set up custom reporting with Amazon Cloudwatch. It also has a handy mailbox simulator that you can use to test out your application (or perhaps, your WordPress site) to see that it’s sending mail correctly and test receiving bounce/complaint notifications. One area where SES lacks is the dashboard. It can be a bit overwhelming to navigate and lacking in information unless you configure custom reports in Cloudwatch or use WP Offload SES to view reports and send statistics. 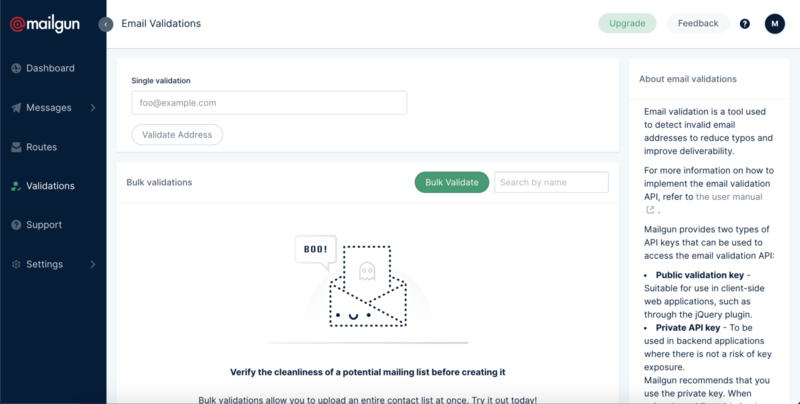 Aside from sending email, MailGun also has an email validation service. This ensures that the email addresses that you’re sending mail to actually exist, which cuts down on bounces and phony emails. The real power of this is realized when integrated into a contact form for real-time validation, so the user submitting the form is quickly notified if they’ve entered an invalid email address (or if they just made a simple typo). SendGrid has all the usual features for transactional emails, but also has the added benefit of full email marketing services. This means that you can manage your transactional email service and send out marketing campaigns in the same dashboard. Winner: Tie. Each email service brings something interesting to the table, and which service is best for you will depend on what exactly you need to achieve. Amazon uses a pay-as-you-go approach, costing 10 cents per thousand emails sent. There are no separate tiers to consider, which makes it much easier to estimate your pricing based on your email volume. You can add a dedicated IP address for $24.95 per month, which came out the cheapest of the three services in this comparison. And it’s definitely worth mentioning that if your website is hosted on Amazon EC2, the first 62,000 emails per month are completely free. So not only do you have the convenience of having one login for your hosting and your transactional email service, you can save a nice chunk of money as well. Mailgun has both a pay-as-you-go plan and tiered pricing. The pay-as-you-go plan charges $0.50 per 1,000 emails, after 10,000 emails for free. The tiered pricing starts at $79 per month, and includes a dedicated IP address and 100,000 emails. If you’re not on the tiered plans, a dedicated IP address on Mailgun will cost you more than double than what it does Amazon SES, at $59 per dedicated IP. This comparison also assumes that you’re using the US region, regions in Europe may carry a surcharge, depending on the plan and your usage. And the email validation API mentioned earlier in this article costs extra as well, but we’re leaving that out for the sake of this comparison. SendGrid has several plans available, starting with a free plan that offers 40,000 emails for the first 30 days. After that the free plan switches to a relatively low limit of 100 emails per day. If you’re over that 100 per day limit, you’ll need to spring for one of the paid plans, starting at $14.95 per month for up to 40,000 emails. You can add a dedicated IP address for $30 a month, and if you intend to use the email marketing tools they will cost extra as well. Winner: Amazon SES wins this one by a long shot. The flat rate of 10 cents per 1,000 emails is both cheap and easy to understand, and it also has the cheapest dedicated IP addresses out of the three providers. The 62,000 free monthly emails is icing on the cake for those hosted on Amazon EC2 too. Mailgun comes in at second place, and it does include 10,000 emails per month free. It’s important to pick an email service that you feel comfortable working with. While all three of these services have WordPress plugins available to make things easier, it’s worth looking into how easy it is to work with the service itself. Amazon SES is definitely the most challenging of the three to pick up and use out of the box. The documentation, while it looks nice on the surface, is very technical and often requires a lot of digging to find exactly what you’re looking for. The AWS console is relatively simple to use, but suffers slightly from overcrowding. The other transactional email providers are built around email as the main service. But here, the SES dashboard feels more like an afterthought. Shameless Plug: Our new plugin, WP Offload SES, can make setting up and using Amazon SES a breeze, but we won’t count that in this comparison to keep things fair. 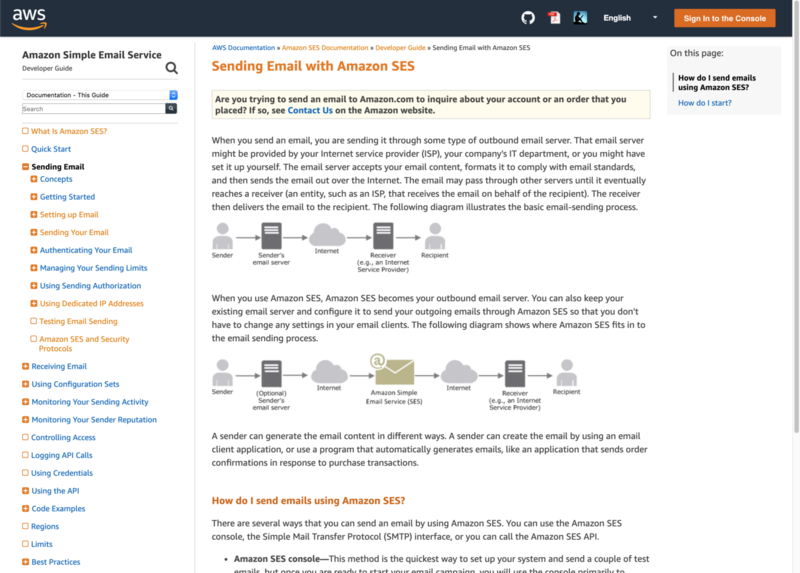 Since Mailgun specializes in transactional emails, it’s no surprise that it’s easier to set up than Amazon SES. The documentation is all relevant and to the point, and does a good job of explaining everything you need to know to get started with Mailgun. 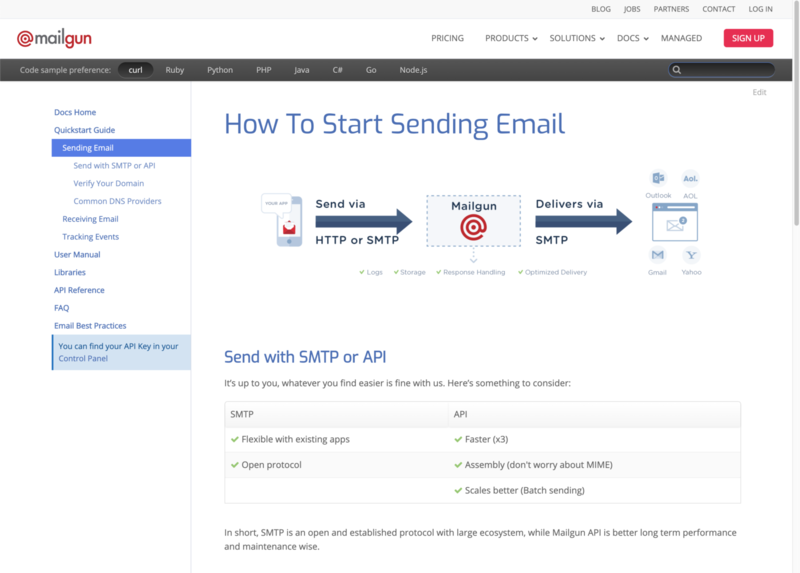 And of course, the Mailgun WordPress plugin makes it easy to use Mailgun over SMTP or via the Mailgun API. 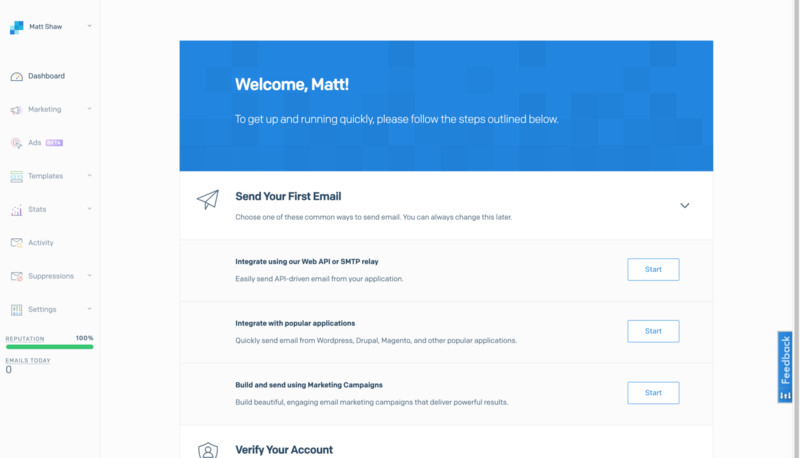 Winner: Without using any plugins, Mailgun and SendGrid come out on top. Otherwise, all three providers have plugins available to make it easier to configure your WordPress site to send emails through their respective APIs. Mailgun, SendGrid, and Amazon SES are all great email providers, and the one you pick will ultimately come down to your priorities and the amount of email you’re sending. Mailgun might be the best choice for a small site that doesn’t send a lot of emails, with a generous 10,000 monthly emails for free. SES will probably make more sense for developers or site owners that expect to send out a lot of emails or are already using other AWS services (especially Amazon EC2). And SendGrid is a great option if you plan to use their email marketing software. What do you look for in a transactional email provider? Have you tried any of the ones mentioned above? Please share your thoughts in the comments. This entry was tagged Amazon SES, email services, mailgun, sendgrid.